It is nearly Halloween and I am paying a fiver to have a quick revel in misery and death through the ages. I actually wanted to pay eight pounds which would allow me on the Ghosts and Murders tour and thus far more misery and death but it is about to start, I need a wee and more to the point, all the other people on the ghost tour have an enthusiastic school child with them. My baby clearly does not want to know about ghosts and hauntings so to go on the tour would mark me out as being a complete and utter loser. I stare sadly after the small huddle led by a man in Victorian garb and wish I was into something cooler or more age appropriate. My spirits are however raised in a very real sense when I see the shape of a woman dressed in black old fashioned clothes walk through the doorway to the keep and then simply vanish. This is it! I have seen a ghost! Then I see she is merely lurking in a corner and is wearing too much foundation, hardly the behaviour of the true undead especially when I see her later with a plastic key fob (not even a great big iron gnarly old key) going through (but in a prosaic normal way) a glass door. But here are dank and ancient stone steps leading down to the bowels of the earth from where guns were fired at attempted invaders. I swear for a minute that a black form appears and disappears in less than a second in the narrow passage ahead but I am tired and in a highly susceptible frame of mind. 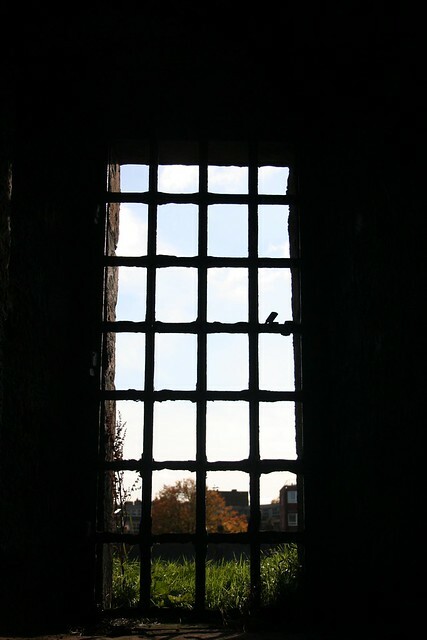 I trot through dark passages, up spiral staircases and peer into claustrophobic little hell holes. Some mesmerizing intricate carvings can be seen on a wall but are annoyingly behind the glass door that the fake ghost went in and locked behind her. I have a sudden terror the ghost tour party are allowed in this bit and am filled with a wholly disproportionate sense of anger and horror. Then down in the dungeon, we catch up with the ghost tour who are listening to the grey haired guide cheerily inform his captive crowd that upwards of three hundred bodies could be crammed in this small space and points at the grooves in the rock, said to be from the tongues of desperate Jacobites trying to moisten their mouths with the damp running down the walls. I want to hear more but am scared I will be accused of trying to steal some Ghost tour so lurk uneasily around until they file past me. I want to see the haunted room too, more than anything else ever even though it must be one I would previously been in but stupidly not sensing its hauntedness. I am sure with a grey haired guide and some sensibly dressed parents and slightly less enthusiastic children, I could not fail to have a face-to-face meeting with a portal into another dimension. An extra three quid seems a positive bargain. I want to follow but there must be some sort of rule about following ghost tours without paying the extra three quid. I look mournfully after them then begin the ascent back from hell into the sunny courtyard. I read later than the ghost is said to be a woman found holed up clutching the skeletal remains of her child. It doesn’t seem so much fun then and the growing realisation of mans inhumanity to man is frankly more terrifying than any ghost I can possibly imagine. This entry was posted on Saturday, October 29th, 2011 at 12:43 pmand is filed under . You can follow any responses to this entry through the RSS 2.0 feed. You can leave a response, or trackback from your own site. 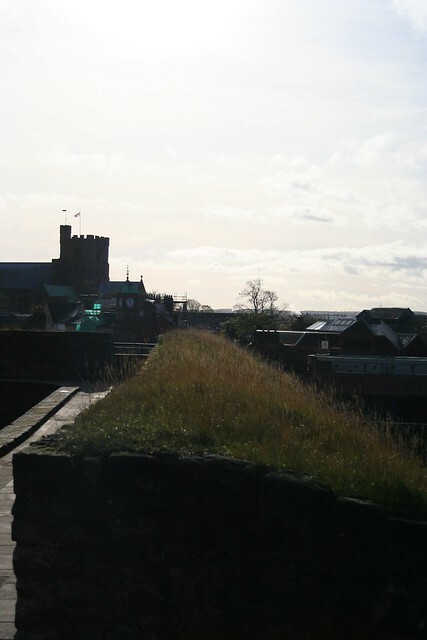 I love Carlisle Castle! Thanks again for a great post. Great blog post. It gave me the shivers. Thanks to Pint-SizedRants for pointing me in the direction of your blog. Am off to have a good nosy around. Thanks Have started writing a new post but struggling with work/baby/inertia at the moment. It’s that time of year. Am a fan of your blog as well-can’t remember if I have put it in blogroll-will check.